We often think of maps as simple tools that help guide us to where we are going, but what if you could develop a highly-engaging map that tells a story about who your organization is, the work it does, and the impact it has? Mapme is a map-building platform that encourages users to do just that. Through its services organizations can create highly visual, customizable maps that operate on both desktop and mobile devices. Offering maps with 3D perspective and integrated media options that include VR and 360 panorama, Mapme’s platform has a competitive edge that makes it worth considering. If a digital map is in your organization’s future, Mapme’s advanced design features might make it the tool for you. For example, Mapme Story Maps allows you to title, provide an overview description, give a logo or image for the general branding of your map, and customize your map’s URL. From there you can add locations based on address. For every location you enter, you can include its name, type out a description, customize its marker, draw shapes and lines on your map, add links, and also add media content. The media content is what allows Mapme to stand out from free resources, such as Google My Maps. Not only can you upload images, but you can also share audio and interactive media, such as 3D, VR, and 360 views. In addition to the above, Mapme offers 16 map designs to choose from as well as three animation styles for moving between pinned locations. Locations can also be organized by categories and filters. Your completed maps can be previewed and viewed in mobile or desktop format, and can be embedded on your organization’s website. 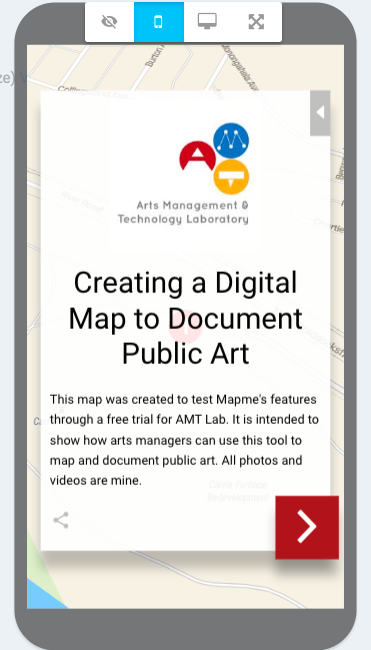 To get an idea of the final product, below are images of the mobile and desktop previews of a map created for this AMT lab review. Arts managers overseeing festivals and limited engagements across a broad area might find Mapme especially helpful, as it not only serves as an engagement tool but can also help visitors prepare and plan for their visit. You can view BLINK Cincinnati’s event map here, which is one of Mapme’s case study examples. Development teams may also find this product useful for communicating organizational impacts to donors. Here is an example of one Mapme creation that focuses on impact. Mapme does offer a free trial that comes with limited functionalities, however the general plans offered are month to month plans, and then 2 premium plans that come with different features and range from $348 to $588 annually. A third premium plan, which includes custom 3D building and other professional services, requires contacting Mapme for a quote. Importantly, the company does offer special discounts to nonprofit and education organizations, as well as multi-map packages designed to be cost effective. Contacting Mapme for a quote is required for these cases as well. Mapme is easy to use. Its functions are similar to those found in e-mail; you can type content, upload media, add links, and easily copy and paste information. No software download is required, and no coding is necessary. Additionally, Mapme has a “Knowledge Base” section on their website with links to video tutorials and detailed how-tos. One of the things that sets this product apart is its high-quality design and visual options. The ability to integrate not only photos, but videos that play on the map, as well as VR make for more engaging, interactive audience opportunities. It is possible to load a large amount of content into your map at once. Data can be imported from an Excel or KML file, meaning it is also possible to import data from an existing Google My Map. Discounts are offered for nonprofits. Of the map design features, there is no street-view option. It is possible that costs will be prohibitive for smaller arts organizations. Although Mapme offers nonprofit discounts, the range of these discounts is not available online, nor is information regarding a sliding scale pricing for nonprofits. Unlike their paid plans, Mapme’s free trial does not allow you to share any story maps you create socially or via a link. This can be a barrier to staff who hope to convey how they can tell their organization’s specific story via Mapme with both internal and external stakeholders. Overall, while it may not be for every organization, Mapme is an interesting option for cultural workers seeking new ways for digital engagement and methods of communication with their audiences.